Egg whites have long been used as a folk remedy for treating acne, although it has been passed down more by word of mouth than by scientific documentation. 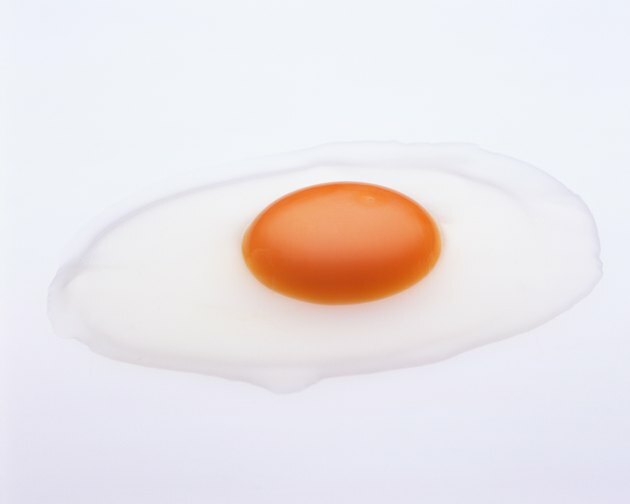 Egg whites are thought to work to treat acne because as they dry on the face, they help cleanse the skin by lifting dirt and debris out of the pores and soaking up excess oil, which causes acne. According to Acne Talks online magazine, egg whites also act as a mild astringent, which helps tone the skin. The best thing about using egg whites to treat acne is that you don't need to purchase expensive creams or equipment; you can just take a trip to your refrigerator. Secure your hair away from your face with a headband or hair tie. Wash your face with a mild cleanser, and rinse well. Crack an egg and separate the white from the yolk. The yolk is also good for the skin, but not for acne-prone skin, as it contains the egg's fat and is too moisturizing for acne. Whisk the egg whites until slightly fluffy. Whisking the eggs makes them easier to spread evenly onto the skin. Dip a sterile cotton ball into the egg white, and then spread onto the face. You can cover the entire facial area, and not just the acne prone area. Place a single layer of tissue on your face to cover the egg white, leaving holes for your eyes, nose and mouth. If you still have leftover egg white, apply it on top of the tissue. Allow the egg white and tissue to dry on your face for a minimum of 30 minutes and up to one hour. Gently peel off the tissue. If you examine the skin side of the tissue, you will be able to see blackheads, dirt and grime that have been removed from the pores with the egg white mask. Rinse your face well with lukewarm water. After you have rinsed off the egg white completely, do a final rinse with cool water. This helps tighten the pores, and prevents dirt and debris from entering them. Never save unused egg whites for another acne mask, as they can become contaminated and further irritate skin. Do not use if you have any allergies to eggs or egg whites.